Sometimes it is difficult to know what to buy for your friends or family members. That's when Gift Vouchers offer a perfect alternative. Let the recipient choose what they would like and provide them with the opportunity to have fun shopping knowing they have a Voucher that will pay for their purchase (or at least some of it). You can use any of the links below to purchase a gift voucher. We will then send you a physical Gift Voucher that you can give to your loved one and fill in the details "To" and "From" on the Voucher to personalise your Gift. 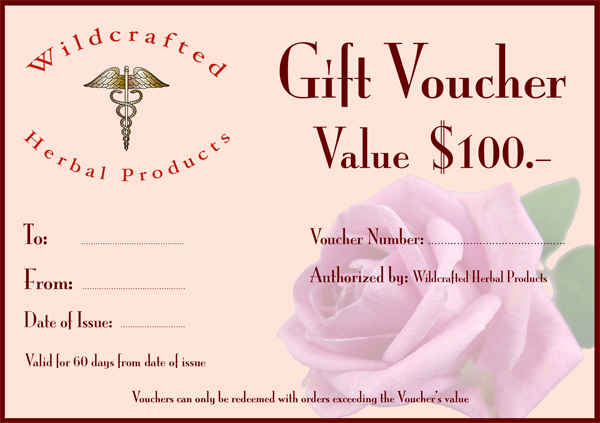 The recipient can then use the voucher when purchasing products from Wildcrafted Herbal Products. Please be aware that the order must exceed the value of the voucher; the dollar value is in Australian Dollars and Gift Vouchers are not redeemable for cash. You Can Choose from the following Gift Vouchers (clicking on any of the Vouchers below will take you directly to our shopping cart (it will open in a new window/tap). Please note: If you are purchasing a Gift Voucher and no other products, please use the drop down menu in the cart to select from one of the following options: (i) Printed Material (Australia) or (ii) Printed Material (Outside Aus) depending on whether the Gift Voucher is to be sent to an address within Australia (option-i) or an address outside Australia (option-ii). No postage charge is applicable for Australian order, however there is a charge of AUD$7.50 for Gift Vouchers to be sent outside Australia. If you are ordering other products as well, please use either "Australia" or "World (Outside Australia)" from the drop down menu. 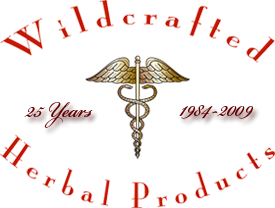 Feel free to contact us should you have any questions about our Gift Vouchers. Our first Wildcrafted Cottage is soon to be opened and will be located in the Blue Mountains west of Sydney, Australia. Please Visit our Wildcrafted Cottage Website for more details.